Start of Week 4 With So Much Appreciation In Our Hearts! 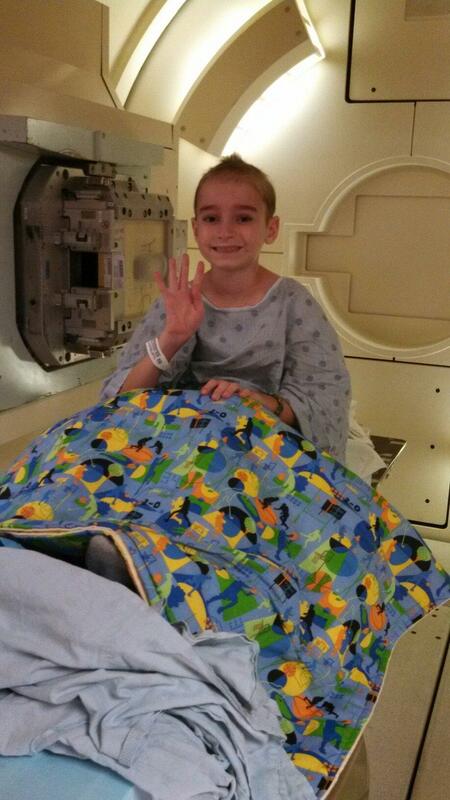 5/6/2013 | Travis the Warrior --- Kickin' Cancer! After such a busy and fun weekend, we realized that we forgot to thank some of our friends for their kind gestures. Thanks to the Price family and Trina for the great care packages! Thanks to the Kohn and O’Leary families for your generous gifts! Travis loved everything! And, thanks to the Yousko family for a great pre-Cinco de Mayo dinner for Tyler and Grandma! Here we go with our 4th week of full cranial/spinal treatment. We had an appointment with the doctor prior to the proton treatment so we had to get an earlier start. Travis wore his JJ Watt hat today and everyone was commenting on it and what a nice guy he is. Travis just smiled from ear to ear for which we can’t thank Lisa, Kevin and JJ enough. Then as we started the treatment, Tony had to leave for the airport to head back home to Carlsbad. After the treatment, Travis spine was a little sore. They are reducing his steroid every few days and he may be experiencing some inflammation due to the radiation. When we returned home, we had another great care package from Aunt Judy and Uncle Doug. Thanks Danny for the great idea of the Messi jersey. Travis loves it! We also had some beautiful flowers and a very nice note from Kimberly here in Houston. Thank you so much for brightening our day. Tony made it back to Carlsbad where Tyler and Grandma picked him up at the Coaster station in Encinitas. They had a great meal provided by the Splavec family. Thanks Kelson for all of your support! Sorry if we missed anyone but we truly appreciate the overwhelming support we are receiving from everyone. Amazing!